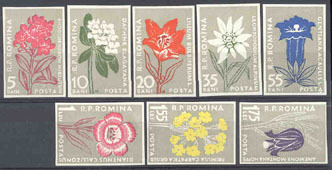 4142 EP ROMANIA (1957) Flowers*. Set of eight imperforate proofs printed on chalky paper and different size. Scott Nos 1161-8, Yvert Nos 1517-24. A very rare set of proofs!